Acadian Genealogy Homepage; Tracing the origin of the Acadians! 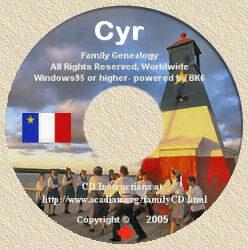 While the Internet is probably the single best source for tracing the origin of Acadians, it is possible to trace the genealogy of most Acadian families from censuses taken in 1671, 1686, 1714 and 1752, as well as from parish registers kept in many localities in Acadia, dating back some fifty years prior to the deportation of 1755. Registers of the oldest parish, Saint-Jean-Baptiste de Port-Royale, are in the archives in Halifax, Nova Scotia. Those of the parish of Saint-Charles des Mines (Grand-Pré) were taken by the deported Acadians and ended up at Saint-Gabriel d'Iberville, in Louisiana. They are now in the archives of the Archbishop of New Orleans. In the early 1900's, most of the registers of Beaubassin were found in La Rochelle, France; they cover the years 1712 to 1748. Unfortunately, registers of three other Acadian parishes... Cobequid (Truro, N.S. ), Pisiquid (Windsor) and Saint-Joseph de la Rivière aux Canards, disappeared. Cobequid and Pisiquid registers were never found, however the Rivière aux Canards registers were brought by Acadian exiles to Virginia, then England and finally to France. Mgr. Tanguay discovered them by accident in Paris in 1867, but they were lost again. The Archbishop's archives in Quebec has some of the original Beaubassin parish registers, dating from the end of the 17th century. Fortunately, nearly the entire population of Cobequid and most residents of Pisiquid fled to Ile Saint-Jean (Prince Edward Island) around 1750, when the attitude of the English towards the Acadians started a panic. Thus, a census taken in 1752 in Ile Saint-Jean lists most of the families from Cobequid and Pisiquid and helps replace the lost registers. As for tracing the Acadian families who lived at Saint Joseph de la Rivière aux Canards (the second parish of Grand-Pré), historians Rameau de Saint-Père and Reverend H.R. Casgrain obtained from the national archives in Paris, near the end of the century, important documents pertaining to that locality. They deal with the genealogy of a large number of families from the Grand-Pré region who had been deported to Virginia in 1755, thence to England and repatriated to France after the Treaty of Paris of 1763. The documents consisted of sworn statements by Acadians who were established at Belle-Isle-en-Mer, on the coast of Britanny, designed to give them legal civil status in France, since they had no baptismal records. These sworn declarations effectively replaced the lost registers and were another key to tracing family genealogies. Reverend Casgrain published his findings in Le Canada Français (1889-1890). They are of special interest to descendants of Acadians who live in Louisiana, because many of their ancestors emigrated from France to the banks of the Mississippi, especially in 1785. The above-noted is an excerpt from Bona Arsenault's History of the Acadians and is reproduced with permission from and thanks to La Fondation de la Société historique de la Gaspésie. It was thought that the area offered protection from raiders. Francois Grave Du Pont and Jean de Biencourt de Poutrincourt sailed back to France before winter. French noblemen, Catholic & Protestant clergy, laborers, and artisans were in the that first group of men. Over the winter, 35 men died. Besides the weather, scurvy was a problem. In The Jesuit Relations and Allied Documents ... 1610-1791, ed. R.G. Thwaites, Father Pierre Briard wrote that of the 79, only 11 remained well. Our best record of those days can be found in Marc Lescarbots History of New France, where he tells of the pleasure which I took in digging and tilling my gardens, fencing them in against the gluttony of the swine, making terraces, preparing straight alleys, building store-houses, sowing wheat, rye, barley, oats, beans, peas, garden plants, and watering them, so great a desire had I to know the soil by personal experience. The rye, he tells, grew as tall as the tallest man. Seeds were planted in March/April to see how early theyd take. Hogs and sheep were brought to Acadia the year before (1605). Lescarbot tell how the hogs multiplied quickly and how they liked to lay abroad, even in the snow. There werent many sheep (he says he had one). They also had hens and pigeons, though they didnt reproduce well. The ships brought the gray rat to Acadia with them. A water-powered gristmill was constructed to grind the grain. Theres mention of an axe, hoe, and spade, but not a plow. Note: Lescarbot's Histoire de la Nouvelle France is online as a set of GIF images. In 1609, Marc Lescarbot drew maps of Acadia and of the Port Royal area. His map of Acadia (right) has the word Souriquois, which was an early name for the Mi'kmaq Indians. The maps can be found in his book, Histoire de la Nouvelle France. Poutrincourt was the son of Florimond de Biencourt and Jeanne de Salazar. He married Claude Pajot on Aug. 14, 1590 and they had 6 daughters and 2 sons (Charles and Jacques). After returning to France, Poutrincourt died in 1615 at the battle of Méry sur Seine. Poutrincourt's son, Charles de Biencourt de Saint Just, was with him on the Jonas, which left from La Rochelle, France on May 13, 1606. This was Poutrincourt's second trip to Acadia. Jean de Biencourt de Poutrincourt, Baron de Saint Just became the first seigneur of Acadia when de Monts granted him the Port Royal area in 1604. Upon returning to France, he applied for and received confirmation of a grant in the area. Poutrincourts wife was probably the first European woman in Acadia. There may have been a couple of women in Alexander's group in 1628/29. When it came to finding a wife in early Acadia, the only females to be found were the Indians. Taking up with the Indian girls was objected to by the priests. When it happened, it was more likely for the fellow to follow her to the forest than for her to follow him to the fields. The absence of wives and families may have been the biggest thing holding back agricultural development. It had been shown that crops could grow, but women and children were needed to help in the fields and garden and to process the food in the home. Poutrincourt returned to France before winter. Charles de Biencourt and the men faced competition from Du Ponts son, who was trading at the St. John River area. Problems soon began with the priests. They wanted to turn the trading post into a mission. Poutrincourt was looking to make money, not new Christians. Another group went to Acadia in 1613 and picked up the priests at Port Royal to settle elsewhere. It is said that they wanted to take over Acadia outside of Poutrincourts grant. They settled St. Sauveur on Mt. Desert Island with 30 men, goats, and horses. Port Royal now stretched as far as Pre Ronde. Champlain made a map in 1612/13, which refers to the area as Acadye. An account of a May 1613 visit to the area is mentioned in Biards Relation for 1616. Late in 1613, Poutrincourt left La Rochelle for Port Royal with supplies. But before he arrived, Samuel Argall had paid Port Royal a visit. Samuel Argall, a freelance trader from Jamestown, had been authorized by Gov.Dale to drive out any French south of latitude 45 N. He attacked St. Sauveur first, and then Port Royal in November. To took their goods and burned the settlement down.The people were scattered and the livestock killed. Poutrincourt arrived in spring 1614 to find just a few men left .. the others having moved on or died. Though Poutrincourt decided to abandon the colony, his son and a few others (Claude LaTour, Charles LaTour, etc.) decided to stay to trade for furs for the La Rochelle merchants. A number of the men, including Louis Hebert, left Acadia at this time and returned to France. Louis Hebert was to later (1617) return to New France to settle in Quebec and is said to have established the first family in New France. When Poutrincourt was killed in 1615 in France, his son Biencourt took over his grant. Biencourt and an undetermined number of men appear to have been living in the area. For the next couple of decades, they traded for fur and perhaps did some farming; but the concentration was on trading (and hunting, fishing, etc.). In 1616 alone, 25,000 pelts were produced in Acadia [Clark, p. 82] The French that remained were said to be mainly of Huguenot stock. They lived with the Indians in the woods. Forts were build at Pentagouet, on the St. John River, and at Cape Sable (Fort Lomeron). Lomeron was a merchant who supported Poutrincourt and later the LaTours. Alexander finally set up a colony at Port Royal in 1628/29. Harvey, in Sir William Alexander states that Alexander probably settled at Gaspe with 70 men and tua weemen (p. 20). The Alexander group moved to Port Royal in 1629. Though the date of the settlement is argued among scholars, falling from 1627 to 1629, we do know there were Scottish present from 1629 to 1632. James Stewart started another Scottish settlement at Port Baleine on Cape Breton (Ile Royale) in 1629. Alexanders son dropped 50 men off there on his way to Port Royal. A Frenchman, Capt. Charles Daniel captued the settlement 3 months later and deported the Scottish. Alexanders son arrived at Port Royal to find that 30 of them had died. After France regained Acadia and New France under the Treaty of St. Germain-en-Lay in 1632, some of the Scottish settlers left for New England. At 46 of them left for England in 1633. According to La Gazette de Renaudot (Feb. 11, 1633), Razillys ships dropped the 46 off at England on the way back to France. In 1632, France once again gained control of New France (including Acadia) under the Treaty of St. Germain-en-Laye. This time, they started recruiting sending men and women with the intent of raising families and settling down in Acadia. "The sorrow that there is to solve the difficulties which are in the large companies made differ two months, and opiniatreté of the wind of downstream two other months later than I had not told you the loading for the Company of New France. But finally the loaded vessel from La Rochelle arrived to join two others from Morbihan that Commander de Razilly (having the commission of the King to control in the extent of the country in the absence of the Cardinal Duke de Richelieu, brought there at the beginning of this month, charged with all things and three hundred elite men. It carries the assent of the King of Great Britain to remove the Scots out of Port Royal and take of it possession in the name of the Company, which sends to it three Capuchins for the conversion of the people of Acadie, in addition to five Jesuits that it already sent in the other dwellings of Cap Breton, the Gulf and the St. Lawrence River. The embarkment of this noble force returning there illustrates the beginning of colony which will make an easy passage to all the French, for the honor of their nation and their peace, that it will be from now on easy for them to comply with the King, that the great businesses of its kingdom do not prevent it from going across the seas the concepts to increase the Catholic faith, by a procedure quite distant from that which was practiced until now in the discovery of the Indies, where one was satisfied with spoils and to captivate the people." [D'Auray, lower Bretagne, 16 July 1632]. Among the leadership were Razilly, his relative dAulnay de Charnisay, and Nicholas Denys de la Ronde. They group was said to be French Catholic, but their exact place of origin is unknown. He left them and supplies (livestock, arms & ammunition, seeds, tools, etc.) at La Have on Sept. 8. D'Aulnay also moved his base of operations. La Have, which was reported to have 44 inhabitants in 1635 [Denys, Description, p. 482], had been Razilly's base. Sometime between 1635 and 1640, d'Aulnay moved his group to Port Royal. There is some evidence that some of the men (especially those who had married Indian brides) stayed behind. The fort at La Have was later (1653) burned down by LeBorgne. In the year 1636, we find just about the only surviving passenger list of people going to Acadia. Though most of the names on the passenger list are absent when the first census is taken (1671), we do find a few Acadian progenitors aboard the St. Jehan, which left for Acadia on April 1, 1636. Some familiar names are: Isaac PESSELIN dit CHAMPAGNE, Pierre MARTIN, Guillaume TRAHAN. D'Aulnay was a sea captain who was first cousin to Razilly. Born around 1596 near Loches, Touraine, France, his father was Rene de Menou, counselor of state for Louis XIII. His father was seigneur de Billy et de Charnisay; and his mother owned the seigneury of d'Aulnay ... hence his other names. D'Aulnay had arrived in Acadia on July 4, 1632 with Razilly. He made yearly trips back to France to bring back goods and to recruit settlers. Around 1638, he married Jeanne Motin, daughter of Louis Motin de Corcelles and Marie de Salins. His 7 children returned to France, where the 3 daughters entered religious orders and the 4 sons later died in the military. Nicolas Denys tried settling up a post at Miscou in the 1640s, but d'Aulnay forced him out. When dAulnay died in 1650, LaTour returned as governor of Acadia. LaTours wife died after defending the Saint John fort, and he married dAulnays widow in a mariage de convenance. He brought Lieut. Philippe Mius dEntremont with him. LaTour had to contend with dAulnays main creditor, Emmanuel LeBorgne, who had been dAulnays procureur-generale at LaRochellle, loaning him large sums. Nicolas Denys took advantage of d'Aulnay's death and set up posts at St. Ann and St. Peters. But Jeanne Motin soon kicked him out. Denys, who had been taken prisoner by LeBorgne in 1653 and kept at Port Royal, estimated that there were 270 in Port Royal in 1654. He described the situation at Port Royal at that time. [Denys, Description, p. 466] Robert Sedgewick of Boston had been ordered by Robert Cromwell to attack New Holland (New York). But after he got everything ready, a peace treaty was signed between the English and the Dutch. Since he was "all dressed up with nowhere to go," he attacked Acadia in August 1654 and destroyed most of the settlements (even though it was peacetime) ... including Port Royal, La Have, and the Saint John River. He left the area, but had appointed an Acadian council with Guillaume Trahan in charge. [Clark, p. 113] The seigniorial system was still going strong. LeBorgne was still making his claim against Denys and LaTour. When Denys got his royal grant to the St. Lawrence area in 1654, LeBorgne had to give St. Peters and Nipisiguit back to him. A letter by Meneval on Nov. 7, 1689 shows that Belle Isle was the seigneur of most of the Port Royal area. The Acadians weren't exactly the best tenants. They'd pay token amounts unless heavily pressured. The seigneurs usually got little for the land. The Acadians were almost like freeholders, and paid little taxes. A map of the seigneuries was done in 1700 and sent to France, but no one can find it. Since their days in France, the Acadians thought that the only way to have land was get it from a seigneur, who got it from the king. Acadians also probably thought the land they farmed was the seigneur's, and therefore the king's. In Acadia, grants were poorly described and often overlapped, leading to conflicts. [Clark, p. 114] We find numerous records of legal cases brought by the Acadians; they, like the Canadians, were very litigious. Also, there is a message (Nov. 12, 1657) from Capt. Peter Butler of the Satisfaction to the Navy commanders. Supposedly, there was a list of colonists of 1658 that was around in the 1950s, but it cannot be found. Dulong discusses the missing list at his Michel Forest webpage. According to a document in the Boston archives, Pierre LaVerdure, his wife Priscilla Mellanson, and their sons may have been aboard that ship. Though the parents and possibly one son were thought to have moved on to New England, two of the sons ... Charles and Pierre ... stayed in Acadia. They adopted their mother's name (Melancon/Melanson). When the Grand Pre area was settled, Pierre was a captain and a leader in that community. In fact, government orders were sent through him. In 1666, France made the decision not to send more colonists to the New World. They thought it would not be prudent to depopulate its kingdom to populate Canada. [PAC, C11A, 2:199, Colbert a Talon, Jan. 5, 1666] Meanwhile, many English were still making the trip to avoid religious persecution and for economic success. In 1670, Acadia had about 400 people, while Massachusetts had 40,000. France regained Acadia after the Treaty of Breda in 1667. LeBorgnes son Alexandre LeBorgne de Bellisle became governor from Canso/Baie Verte to New England. Temple caused enough problems and delays that the official change of hands didn't come till 1670. With the arrival of Grandfontaine in 1670 came the directive to conduct a census. The first census in 1671 is our earliest look at the people who made up Acadia. Since few 17th century Acadian church records have survived, we gather much of our genealogy from the census reports. The 1671 Census was counted 392 people, though there were others not counted. Most (350) of the population was in Port Royal, though there were scattered areas of settlement around Acadia. A few were included, but not all. Others (ie. Clark, Rameau) have estimated the population of Acadia at this time as high as 500. In the early 1670s, Jacques Bourgeois led a group of settlers to the Beaubassin area. This area, probably visited by Bourgeois in his travels, held the largest area of marshland in Acadia. Grandfontaine was replaced in 1673 by Jacques de Chambly. In the summer of 1674, Julian Aernoutz, a Dutch naval officer in command of the frigate Flying Horse, was ordered "to take, plunder, spoil, and possess any of the garrisons, towns, territories, privileges, ships, persons, or estates of any of the enemies of the great States of Holland." He sailed to New Orange (New York) and met Capt. John Rhoade who told him how easy it would be to conquer Acadia. By August 1, he had arrived at Pentagouet (military headquarters of Acadia). He found Chambly in charge with only thirty men and quickly captured the fort. He couldn't spare to leave men behind. He did write a short account of the conquest and put 2 copies in 2 glass bottles and buried them in the ground. After destroying the fort, they moved eastward. After less then 2 hours of fighting. they took Ft. Jemseg and the area was plundered. Bottles with a written record of the conquest were buried there as well. Aernoutz declared that the area would now be called New Holland. But, like the English often did, once the valuables of the colony were taken he left them alone. [Daigle, p. 25] De Chambly and Joibert were taken prisoner by the Dutch at this time. Upon returning to Boston, the cannon and other plunder was sold. 1676: In 1676 Cornelis Steenwyck was appointed as governor of Acadia by the Dutch. But by that time, the French authorities had returned to Acadia. For more information on the Dutch "period" of Acadia, check out the books Capt. Francis Champernowne,the Dutch Conquest of Acadie,and Other Historical Papers, (p. 127-159) edited by Albert H. Hoyt (Boston,1889) and Cornelis Steenwyck, Dutch Governor of Acadie, A Paper read at the Annual Meeting of the Canadian Historical Association in Ottawa by John Clarence Webster (1929). Pierre de Joybert de Soulanges et de Marson took over the governorship role from 1677 to 1678. When Marson died in July 1678, Frontenac (governor of New France) wanted to take over Acadia so he sent Michel Leneuf de La Valliere as commander (though this was never approved by the king). LaVilliere moved his family to Acadia and set up his headquarters at Beaubassin (The headquarters for Acadia was often outside of Port Royal.). It is thought that he didnt get official approval from the king because he sold fishing licenses to the English. The Compagnie de la Peche Sedentaire (Compagnie dAcadie), formed in 1682, complained about him. The Compagnie was designed to encourage use of Acadians to dry and salt the fish, though it never really succeeded. Another census was taken in 1678. The 1678 census listed parents (no ages), number of sons and daughters (no names or ages), and livestock. In the mid 1680s, a number of Port Royal settlers decided to move north to the Grand Pre area. The leader of this group was Pierre Terriau. Other early settlers were Claude and Antoine Landry, Rene LeBlanc, and Pierre Melanson. By 1686 in Minas, there were: 57 people, 10 families, 83 acres tilled, 90 cattle, 21 sheep, 67 pigs, and 20 guns. Another census was done in 1686. The 1686 census included more information than the one of 1678. The Treaty of Whitehall in 1686 said that their colonies in America shall continue in peace and neutrality, but it was ignored. In just a few years, they would see that the treaty would be ignored. Perrot was replaced as governor by Louis Alexandre des Friches de Meneval in 1687. Another census was taken of Acadia. The 1693 census included the names and ages of all family members. Another record, let's call it the 1695 census, was made of those in the St. Jean River area in 1695. On June 3, 1693, Abraham Boudrot (son of Michel Boudrot and Michelle Aucoin) returned from Boston (according to Villebon's journal). This shows that Acadians would sometimes travel to New England on business. Acadia was the weakest colony in North America at the time. Its small population made it an easy target. The wars in Europe gave the New Englanders a reason to attack Acadia. As a result of the war of the League of Augsburg, dIberville attacked the English Fort Pemaquid in Maine and took it in spring 1696. The dispute was settled by the Treaty of Ryswick in 1697, which ended the war in Europe. But the peace would only last 5 years. The War of Spanish Succession (1702-1713) in Europe meant another opportunity for the English to attack Acadia. On June 30, 1697, Tierberge wrote some notes on Acadia while at Fort Nashwaak. He had been serving there for the past 2 years. He notes that they survived the British attack of the previous year, and Villebon had added a second line of palisades (of 15" posts) around the fort for better protection. Their condition wasn't the best. He notes that not even 6 men would be able to go out on expeditions. Tieberge mentions that there were only 8 families along the St. John River, including 3 brothers D'Amours, des Chauffours, de Clignancourt, Martel, Baptiste, Bellefontaine, Desrochers, la Jarne, and la Treille. Though they are producing goods, they had no mill to grind grain. And the other Acadian settlements didn't trade with them much because of the traveling distance and the fear of the nearby British. Things were so bad, even the Indians were starving. They had to eat the skins of the moose they had killed. He goes on to describe the activities at Port Royal, Minas, and Beaubassin. Despite the constant French-English conflict, the English brought brandy, sugar cane (from Barbados), molasses, utensils, and trade-goods. In return, the French gave them furs and grain. Boston had been in famine, and the grain was needed in New England. Occasionally, shipments of grain were brought to New England by the Acadians. Much like the Beaubassin area (but 25 years later), Pierre Thibodeau let settlers to settle at Shepody (Chipoudy) in 1698. He had been a miller at Pre Ronde at Port Royal. He and his sons went to the Shepody area and encouraged friends (Blanchards) to settle the Petitcodiac. Three of Thibodeaus sons first wintered the area in 1699/1700. They did very well at trading furs with Indians. Sebastien de Villieu objected, saying they were on his father-in-laws seigneurie without permission. Pierre wanted to compromise, but de Villieu didnt. When de Villieu was ready to deal in 1702, Pierres group refused because they had sent a petition to France and thought theyd get their own seigneurie. In 1705, the decision was made that is was only a concession to La Villieres seigneurie. In 1699, the governor at Port Royal (Villebon) urged that they build a fort with 300-400 men for protection from the English and pirates. Corn and cattle were being raised in the Grand Pre area. Governor Villebon sent 4 men to a cliff to search for copper to work (for 10-12 days), but they didnt find much. A few specimens were sent to France. Villebon heard that the Grand Pre Acadians said theyd join the English if they showed up. The final French governor of Acadia was Daniel dAuger de Subercase (1706-1710). Governor Subercase only had 160 soldiers, 3/4 of them young men from the quays of Paris. He asked for help, but France ignored him. They lived off of the booty of corsairs for the next 3 years. In 1710, the harvest failed and an epidemic drove away the corsairs. [Richard, 1, p. 41]. The 1707 census covered the same areas as the 1703 census and included the same information, except that the children are listed by 2 age ranges. Col. March led the next attack on Acadia. Men from Rhode Island and New Hampshire joined Massachusetts in an 11 day siege of Port Royal, but it failed. Embarrassed, March went to Casco instead of Boston. He wrote to the Governor Dudley and blamed the failure on his officers and soldiers. Boston was upset; plans had already been made to celebrate a victory at Port Royal. March was ordered to try again. He declined and put second-in-command Wainwright in charge. The second siege, in August 1707, also failed. [Richard, 1, p. 39-40]. As for religious leadership in French Acadia, it had been served by 40-50 priests up to 1710. Regular parish priests had been there since 1676 (Port Royal), 1687 (Grand Pre), and 1686 (Beaubassin). They assisted with the governing. The main function of the priest in the life of an Acadian was to perform the sacred rites of baptism, marriage and death. The inhabitants of Port Royal sent a letter to the governor of Canada (Vaudreuil) asking for assistance to help them leave. Vetch had been treating them harshly, and saying that they were lucky that they weren't treated worse. They passed along 3 ordinances of Vetch to illustrate his mistreatment. They again asked if he could "furnish the necessary assistance for our retiring from this unhappy country." [Richard, 1, p. 71-72]. Minas sent a group to Port Royal to see what was in store for them. They couldnt get any information, but Mascarene (an officer with a French background, who could speak the language) was sent to deal with the people at Grand Pre. Mascarene arrived in Grand Pre on Nov. 12, 1710 on the brigantine Betty. He had 59 soldiers, a lieutenant, and a surgeon with him. A captured French vessel was also brought, with furs on board as a present to the governor. An Acadian passenger from Minas was sent to the people with the message, assemble at a good landing place and Mascarene would give them instructions; the soldiers were not there to bother them, but merely to protect Mascarene. The following day, at noon, he landed at Grand Pre on a flat-bottomed boat with 42 men. [Herbin, 39]. In 1711, Vetch left to join Nicholson in a projected expedition against Montreal. Sir Charles Hobby was left in charge of Port Royal. When the Montreal project fell through, Vetch returned to Port Royal (where he held office till summer 1714). Vetch served as lieut-gov. of the garrison; Nicholson was appointed governor on Oct. 20, 1712, but left to go to London to plan the Montreal expedition. Nicholson held the title (though wasn't present) till 1717. Vetch was replaced (as lieut.-governor) by Major Caulfield, who in turn was replaced by Captain Doucette in 1717. The Treaty of Utrecht, signed on April 13, 1713, gave Acadia to England. In the treaty, France ceded "All of Nova Scotia or Acadia comprised in its ancient limits, as also the city of Port Royal." [Richard, 1, p. 73]. More on the treaty can be found in Corinne Laplante's M.A. thesis at the Universite de Moncton (1972), "Le Traite d'Utrecht et l'Acadie: une etude sur la correspondance secrete et officielle qui a entoure la signature du traite d'Utrecht." The only census taken (that gives names) of Acadia under English control was done in 1714. The 1714 census gives only the head of household, if the spouse was present, and the number of girls and boys ... except for Beaubassin, where names were listed for all family members. Vetch wrote a letter on Nov. 24, 1714 to London, showing why he hadnt let the Acadians go. Evidently, they had sent him 6 questions, which he answered. 1) He calls the area LAccady and Nova Scotia and says there are about 500 families (2500 people) there. 2) He notes that all (except for 2 families from New England ... the ALLENs and the GOURDAYs) wanted to move. 3) He also estimates that there are 500 families at Louisburg, plus 7 companies (of soldiers). The French king gave them 18 months provisions and helped them out with ships and salt (for the Fishery) to encourage them to settle there. 4) As to the movement of Acadians from Nova Scotia to Isle Royale, he notes that it would empty the area of inhabitants. Even the Indians (with whom the French intermarried and shared their religion) by take their trade to Isle Royale to follow the Acadians. This would make Isle Royale a much larger colony. He says that 100 Acadians (who knew the woods, could use snow-shoes, and knew how to use birch canoes) were more valuable than 5 times as many soldiers fresh from Europe. They were also excellent in fishery. Such a move would create the largest and most powerful French colony in the New World. 5) He notes that some of them (without much belongings) have already moved, but the rest plan on moving the next summer when the harvest is over and the grain is in. They had about 5000 Black Cattle, plus many sheep and hogs, that they would take with them if permitted. So if they move, the colony will be reverted to a primitive state and be devoid of cattle. It would require a long time and 40,000 pounds to obtain that much livestock from New England. They Acadians were waiting for Nicholson, to get permission to leave. But someone let him know what their leaving would mean, and he referred the matter to the queen. The queen died that August, and a series of delays, pretext, fraud, and deception followed. "Having learnt, sir, from several inhabitants of Port Royal, of Mines and Beaubassin, that he who commands in your absence at Port Royal (Col. Vetch), has forbidden them to leave, and even refused the permission to those who asked him for it, which event makes most of the Acadians now established on the lands of the King of England unable to withdraw this year ..." "That is what has determined me, according to the order given me by the King, to send thither M. de la Ronde Denys, into whose hands I have remitted the orders of Queen Anne; he will confer with you about the reasons why they are detained. I hope, sir, you will render all due justice, and that you will have no other view than to obey the behests of the Queen." The other letter is from the same to the Minister and dated August 29, 1714: "He who commands Port Royal has forbidden the Acadians to leave the country before the arrival of Mr. Nicholson, so that all those who have come here had escaped. They represented to me that it was necessary to send an officer there in order to uphold their rights, the English having forbidden the missionaries to meddle with the affairs of the Acadians." [Archives de la Marine et des Colonies]. He wrote another letter to the Board on Sept. 2, 1715. He noted that Nicholson had forbid trade between Acadians and the garrison (even keeping the Fort gates shut). He also prevented them from trading with the Indians. This had discouraged the Acadians to the point that they were building small boats to take them to Cape Breton. He again wrote to the Board on Feb. 21, 1716. He notes that few Acadians have left (but doesn't describe why). He again notes that their departure would "ruin" Nova Scotia and states that to keep the inhabitants and their livestock in Nova Scotia would be "for the advantage of the Crown." [Richard, 1, p. 92]. Gov. Caulfield wrote to Col. Vetch on Nov. 2, 1715 from Annapolis Royal. He notes that Nicholson had told the soldiers that the French were rebels and would cut their throats if they went into their homes. The soldiers were ordered to have no dealings with them and the gates of the fort were to be shut. But, the soldiers still needed the goods produced by the Acadians. Adams wrote to Capt. Steele on Jan. 24, 1715. He noted that they thought Gen. Nicholson's arrival would mean that the place would be settled. But instead, he pulled down the forts, took many of the soldiers with him, drove away the Acadians ... so that the place looked desolate. He spent most of his time cursing Gov. Vetch and his friends. All ... English and French ... reviled the man. [Richard, 1, p. 93] While in London, Vetch tried unsuccessfully to oust Nicholson. Doucette took over as lieutenant governor in 1717. The French were still ready to move, rather than take the oath. But it appears by this time some Acadians had decided to stay put on peaceful terms. When the Indians learned of this, they threatened the Acadians. Though they had always been friends, they didn't want the Acadians going over to the English side. Doucette demanded that they take the oath, but they thought by doing so it would tie them down ... and they still wanted to move. They said if they were to stay, they wanted protection from the Indians and the oath would be stated so that they would not have to fight their own countrymen. But the governor wanted an unconditional oath. [Herbin, 50]. Nicholson, who later (1720-25) went on to become governor of South Carolina, was replaced by Col. Richard Philipps, who would be governor until 1749. But he only visited Acadia in 1720-22 and 1729-31. The lieutenant governor would be the acting authority in the land. Doucette was lieutenant-governor again from 1722 to 1725. He was replaced by Armstrong, who was violent and had a bad temper. He had problems with everyone. This caused some French families to leave, and others to make the same plans. But he adjusted his attitude, for he too recognized the need to keep the Acadians where they were (for now). He got the Port Royal Acadians (which was about 1/4 of the population) to take the oath by reminding them that England did not allow Catholics to serve in the army. He sent 2 officers to Minas to try the same approach, but they failed. He then sent an officer to try. Wroth offered them the following oath to take ... I do sincerely promise and swear that I will be faithful and bear true allegiance to His Majesty King George the Second, so help me God. This meant that they wouldnt have to take up arms against the French or Indians, they could leave whenever they want, and they had the freedom to have priests and to practice the Catholic religion. [Herbin, 56] Since that time, they were often known as the "neutral French." England had banned the Acadians from developing new land. But the rapidly increasing population forced them to do so. At Beaubassin, for example, they spread out to the Memramcook, Petitcodiac, and Chipoudie rivers areas. In the 1730s, England bought out the rights from the LaTour family and assumed the seigniorial system was over. England wanted to settle the new lands with their own settlers. England did try to collect taxes, but again the Acadians came up with a variety of excuses. Only 30 pounds were collected in 1732, and only 15 pounds in 1745. Generally, if the Acadians had a problems they settled it amongst themselves (priests, patriarchs) without going to the English authorities. [Daigle, p. 40]. Even though the Treaty of Utrecht allowed the practice of Catholicism "insofar as the laws of Great Britain allowed," those laws of Great Britain were stacked against Catholicism. But the Acadians' religion was not infringed upon by the English. The English allowed them their priests, but were concerned about their influence. They sometimes accused priests of creating an anti-English feeling ... of using the sword more than the cross. [Micheline Dumont-Johnson, Apotres ou agitateurs: la France missionnaire en Acadie Trois Rivieres, Boreal Express, 1970]. The missionaries had some degree of influence on the Indians. But the Indians didn't give them (or even their own chiefs) complete authority. The French officers at Louisbourg and Beausejour were jealous of their influence, and the English officers at Port Royal were wary of it. The Acadians were about as literate as any isolated section of New England. They were hard-working, skilled at their tasks, traded well, and had high moral standards. They just wanted to be left alone. For about 20 years, things were peaceful. The Acadians had put dykes in so that all of the land was available for farming. Farms were divided, since new land was reserved for Protestants. When war broke out in the 1740s (War of Austrian Succession), Louisbourg thought the Acadians would fight on their side, and England thought they might revolt also. The Acadians were still holding fast to their 1730 oath. Some may have gone one way or the other, but most stayed neutral. Louisbourg first heard of the news that war had begun (on March 15, 1744) and attacked a fishing port at the Canso straight. Another force from Louisbourg attacked Annapolis Royal (Port Royal) in August, but failed. In mid-winter of 1745, New France sent Sieur de La Malgue (with 100 militiamen and 400 Indians) to Nova Scotia. They tried to recruit help in the Acadian settlements. They arrived at Annapolis Royal in May. [Daigle, p. 41]. France wanted Acadia back. Mascarene (the governor's representative who was a French Huegenot) knew that the Acadians wouldnt give France aid, though French Canada thought they would. France invaded Acadia 4 times and supplied arms and ammunition ... but they didnt want to fight. They were living under a mild and tranquil government and didnt want to stir the up trouble. They even objected when the French wanted the soldiers to spend the winter at Minas. [Herbin, 63]. France lost Louisbourg during this period of conflict. A large fleet was sent to recapture it and Acadia.in 1747. There were only 220 soldiers at Port Royal, but New England wasnt far away. Troops under Chevalier de Ramesay were sent from Quebec to Chebucto (Halifax) in early spring 1747. But the fleet hadnt arrived so he went to Port Royal. With still no signs of the fleet, he returned home. Finally, some of the fleet arrived at Chebucto. Ramesay returned to Port Royal, but the fleet still didnt show up and he again returned to Quebec. Storms and plagues had destroyed the largest fleet France had ever sent across the Atlantic. Mascarene sent an appeal from Port Royal to Massachusetts governor Shirley for help, and 500 volunteers (commanded by Col. Arthur Noble) were sent. They got to Port Royal in fall 1747. Some were sent by ship to Minas, but returned due to bad weather. In November, about 100 marched over frozen ground to Minas and stayed with the inhabitants. The rest tried to make it by sea, but had to land (at French Cross, or Morden) and walk the last 40 miles. It took them 8 days to reach Minas. The landing place in the mouth of the Gaspareau was one mile from Grand Pre. The ships arrived safely with the supplies, which were left at the landing place for the winter. The soldiers stayed in 24 houses along the highway. To the horror of the Acadians, a British flag was hoisted on the church steeple. Ramesay had built a fort on the isthmus and controlled the area. Noble wanted to march on it and drive off the French. Near the center of Grand Pre was a stone building, where Noble put the cannon. Upon hearing that Noble wanted to attack him (and underestimating Nobles troop size), Ramesay planned a night attack on Grand Pre. Since Ramesay had hurt his knee on the 2nd march to Port Royal, Capt. Coulon de Villiers was in charge. After 4 days of preparation, he left on Jan. 21 and led 240 Canadians and 20 Indians through 3 feet of snow. They reached Piziquid, 15 miles from Grand Pre, on the 9th. They divided into 10 groups as they approached the Melanson village, on the banks of the Gaspereau. They took shelter and warmth in the Acadian homes, and even found a wedding feast going on. The prospective bloodshed brought a somber tone to the evening. They learned that Nobles men were in 24 houses on a 1 1/2 mile section of the main road in Grand Pre. There were now 346 French, who divided into 10 groups. It was 2 in the morning and had been snowing for 30 hours straight. You couldnt walk without snowshoes. They arrived at about 3. Noble was killed. The English surrendered a day later. Of the 350 member French force, there were 7 killed and 15 wounded. The English force of 525 had 100 killed, 15 wounded, and 50 captured. Eleven of the 12 houses attacked were taken. The Acadians at Minas had warned Noble that the French would attack, but he ignored them. Coulon left on Feb. 12, after burying the dead. [Herbin, 62-72]. Ramesay claimed that Minas owed submission to France. The Acadians wrote Mascarene (at Port Royal) asking what to do. Gov. Shirley sent a brig, 2 schooners, and 300 men to Minas who stayed there 4 days. Minas had its boats taken, so if they wanted basic goods (ie. salt), they had to make the trip 60 mile trip to Port Royal. Halifax was founded in 1749 and was the governmental headquarters. From Halifax to Minas was only a trail. Jean Melanson (from Canard) and Claude LeBlanc (from Grand Pre) made the trip in a few days to speak to Cornwallis on behalf of the people. They found that they were supposed to bring a proclamation back to their people and make it public. They had to take the oath without restriction. The deputies (representatives) from all areas returned to respectfully say no. Cornwallis said everyone had to take it without exception by Oct. 26 or lose their rights and property. The deputies went to the people, told the news, and reported to Cornwallis in a few weeks. What they brought back was a paper with a thousand signatures referring to the previous oath and how well theyve behaved since then. It repeated their fear of the Indians and asked if they could take the same oath as taken under Philipps; otherwise they wanted to leave the country. Cornwallis was harsh about it. He wrote to the Lords of Trade saying he would use the Acadians while they were there. And he prevented the Acadians from leaving. The French were building a fort at Beausejour. They got Abbe Le Loutre to try to talk the Acadians into moving to French territory. The Acadians were concerned about Cornwallisplans. Actions by the French got some Acadians to join the Indians in acting against the English. It was too late in the year for a general withdrawal, though some left. [Herbin, 80]. The English sent ~100 men to Minas under Captain Handfield to prevent Acadian movements. It was too late to build barracks, so they enclosed 3 houses, in a triangular picketing with half bastions, on a hill. A blockhouse from Port Royal had been brought and set up in the camp. The fort was known as Vieux Logis. The people helped provide for the soldiers, helped poorer settlers build houses at Halifax, and cleared a road to Halifax about 18 wide. [Herbin, 81]. In October 1749, 300 Indians (spurred on by the French) blockaded the Minas fort so the Acadians could leave; shots were fired, but no one was killed. But the people wanted to wait to hear from the governor, so the Indians left. The Indians surprised an 18 man group led by Capt. Hamilton and took them and notary Leblanc with them. By 1750, a fort (Ft. Edward) had been built at Pisiquid. Cornwallis still wanted them to take the oath, and they still wanted to leave the country. The English began importing settlers in 1750, but they had to be kept in the Halifax area until the Acadian issues could be solved. In late 1751, after years of service and in ill health, Gov. Cornwallis resigned as governor. In August 1752, Col. Peregrine Thomas Hopson - the former commander at Louisbourg who had been at Chebucto since 1749 -took over as governor. He sent most of the German settlers to Merliguish (which was renamed Lunenburg) in 1753. (NSHS, V. 1). They offered to explain the petition to him. The petition was signed by 44 people from Minas, Canard, and Piziquid. The English carried off the priests, raised the English flag above the churches, and used them for barracks. The priests were insulted and mocked for 45 minutes when they got to Halifax. [Herbin, 93]. On July 28, 1755, Lawrence and the council decided to deport the Acadians. Since troops from New England were in the area (they had helped to capture Beausejour), he sent a note to Moncton letting him know that as soon as the transports (which had been ordered) arrived. [Herbin, 94]. I am grateful to Tim Hebert for providing me permission to post the above-noted information. Visit his excellent Acadian-Cajun web site. 1671, 1686, 1693, 1695, 1698, 1700, 1701, 1703, 1707, 1708, 1714, 1732, 1739 and 1752. 1713, 1715, 1716, 1717, 1719, 1720, 1721, 1722, 1723, 1724, 1726, 1734, 1737, 1748, 1749 and 1774.